There are 3 Lifts within the Complex. Pool Heating, Shared Pool, Parking, Garden. Fridge, Iron, Microwave. Internet Access, Room Fans, Satellite, TV. Fully tiled bathroom with bath, shower over bath, wc, hand wash basin with vanity unit. with 2 single beds, bedside tables, double wardrobes, safe and ceiling fan. Towel and Bed Linen are provided and the room is cleaned at the beginning of your stay with a Linen Change once a week unless otherwise requested. N.B. Pool Towels are not provided. The Santa Maria Complex is Secure and Very Well Run, with 24 Hour Reception and Security, Limited Car Park is also Available. There is a Heated Swimming Pool, Life Guard, Roof Top Solarium, Pool Bar Serving Food and Drink Until Late. There is an Extensive Day and Entertainment Programme. Also On Site is a Hairdresser, Car Hire and Excursion Kiosk, TV/Games Room, Small Laundry and Tennis Courts. Free Wi-Fi Access in the Public Areas of the hotel. For the comfort of future guests we kindly request you confine smoking to the Balcony. The kitchen is equipped for 2 people with microwave, toaster, kettle and fridge. Dining area with seating and table and ceiling fan. Bedrooms: Defined sleeping area with, twin beds, bedside tables, double wardrobes, safe and ceiling fan. Bathrooms: Fully tiled bathroom with bath, shower over bath, wc, hand wash basin with vanity unit. Kitchen: The kitchen is equipped for 2 people with microwave, toaster, kettle and fridge. Dining area with seating and table and ceiling fan. Utility Room: Mop, bucket, sweeping brush, dustpan, iron. Living Rooms: Lounge Area with Settee, Flat Screen TV, DVD Player, Portable CD/Radio. Wi-Fi is available in the room, Credits are bought at The Reception. 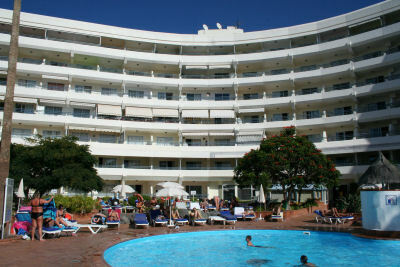 There are Ample Free Sunbeds and Parasols both around the Pool Area as well as on the large Roof Top Solarium. The Pool Side Bar/Snack Bar is Open All Day. Weekly Outdoor Barbecues. 2 Shared Pools and Tennis Courts. Mop, bucket, sweeping brush, dustpan, iron.